Tis a Glorious thing I ween to be a Regular Royal Queen. But a right down regular , regular , regular ,regular Royal Queen. Well there a parade of Old Queens at the 350th Birthday Mayfayre. And a lot of them were in my booth ...boom boom . I have been sitting on a lot of 'making of' pics of these , as I did not want to spoil the surprise. But now its time to share ..hope you wanna see 'em ? Here's a small selection. If anyone wants to see a few step-by -step ones , Im happy to post some. Hello Les .... did not see you at the weekend ( of course chart does not mean you were not there ...it was so crowded ) . Yup Queen Victoria was the other 'Old Queen' in the show. I don't have a pic of her at the mo ...something I will put right today. So I will take a pic later ...before she goes through the bandsaw to have her face sliced off . Love to see any pics you have Richard, be great to see, thanks for sharing them. Odd to think that this time last week we were watching 350 sausages come out of a Birthday Cake in Covent garden - it's a strange old World isn't it ! The Unkindest Cut of All .. I will glue them together with Screwfix wood glue now , and that will be all I can do until tomorrow when the glue has hardened enough to put the whole face against a disc sander to make it the right thickness to glue back to what is left of the first head . After that I am going to need to think about redoing her hair ..as it rather got shredded by the bandsaw ...a lucky accident as it happens ..as I need to give her a more accentuated centre parting - which was quite a distinctive part of her 'look' ..and something I did not get right the first time around. Far from "portrait - perfect" ..but infinitely better than she was - and the hairline , when done will help a lot : the large 'gap' at the top of each each is to allow the flat swoops of hair to tuck between ears and head . She will also get a better Crown . Now that all the "jubilation" is behind us , and Queen Victoria is all but finished - I thought Id post some more pics. I did actually use her all over the Jubilee period , as I was at Blists hill Victorian Town ...and she is very much an 'expected' part of the show there now. Slow and fiddly stuff - but the result was worth it. Fascinating stuff Richard, I will really enjoy a long viewing of the step-by-step-pics in the near future. I like the colouring of the new face, sometimes we need to push ourselves to get away from our 'usual' approach. Interesting to see how you tackle the hair. I've no experience of the sander you use, just found some pics of it, and it looks bigger than I expected, is it always a two handed job to use it? As always a picture tells the story better ...so I will take one later , as I despite having loads of work -in -progress pics , they are all of the puppets , not the tools. More on the Finished Victoria soon ...I changed her crown fabric to plain purple ..that paisley red was a mistake. But here is the other new puppet from the Mayfayre ( soon to be in my Summer Season at Heights of Abraham ) ..Queen Elizabeth 1st ....the most elaborate and time consuming costume on a single puppet I have ever done. The head , unmounted was started in 2009 I think ? , and then tucked away unfinished. Remembering I had this , was the inspiration for making this summers show a Royal comedy of 'always the wrong Queen' . Here is the wooden shape that will form the dress -I knew form the outset that her appearance in the show would be very quick , she would not be bashed with a slapstick , and her purpose was to be a 'cough and a spit and a nice costume' as one of my drama school teachers used to say. 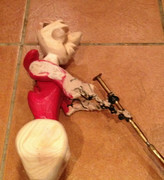 For that reason - and to give the dress nice shaped waist - I knew she would need to be a rod puppet , not a glove puppet. Notice the line of holes in the wooden arc behind her head ? ...these are to take the power magnets which will hold her big stand up collar in place ...I know that it would be big and fairly delicate , and I would want to remove it to make packing her away in the puppet box easy ...but I also did not want fixing it on , or taking it off to be a chore ...so magnets on the puppet , and correspondingly in the collar made it both a fast and strong bond. I knew it would take a lot of cloth ..so I rummaged in the attic for what I had the most of, knowing it would take about a yard and a half . Also I was looking for a suitable pallette of colours and textures . I 'dressed up' the head to test out the look ... I often do this if its a fancy costume. Last edited by Richard Coombs on 21 Jun 2012, 22:45, edited 3 times in total. And after many , many more hours of beading. Last edited by Richard Coombs on 21 Jun 2012, 22:45, edited 1 time in total. Up till now all the bits have only been loosely pinned to the puppet . Built in laminated slices - for speed- , & also as I knew I wanted to make 2 identical heads. Holes in Body to keep weight down. Last edited by Richard Coombs on 24 Jun 2012, 12:47, edited 3 times in total. Very interesting series of pictures Richard, informative and inspirational. 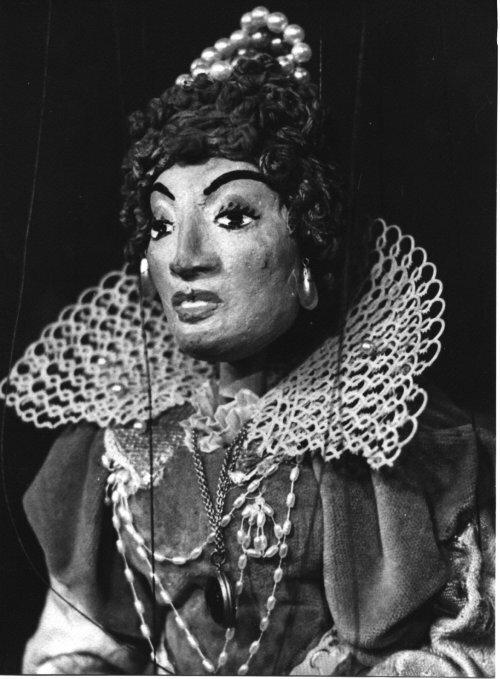 I thought you might be interested in our Good Queen Bess, a marionette, made and costumed by Eric Bramall. Well I say that, but it may have been costumed by Madge Stavordale. 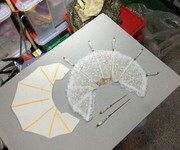 Eric made the puppet for Buster Stavordale for use in their shows at the Festival of Britain. There is a duplicate version of her to sit on a horse. The horse was carved by John Carr. Somewhere I have a sound recording of the scene where she addresses the troops. I rather think the voice is that of Ann Hogarth (of Muffin fame). Now how's that for name dropping - but only meaning much to those either long in the tooth or those with an interest in British puppet history.